Since the elections in September, international attention on the political situation in the Netherlands has faded. But, over the weekend, a new opinion poll by Maurice de Hond revealed a big change. 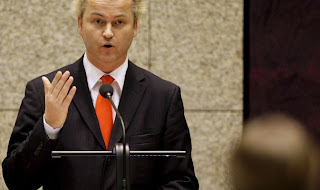 Only three months after his defeat, the party of right-wing populist Geert Wilders (photo), who campaigned on a platform in favour of the Netherlands leaving both the eurozone and the EU, is resurgent. Wilders' PVV would be the country's most popular party were these results repeated at an election. That this would be with only 16% of the vote illustrates how volatile Dutch politics has become (it should be noted that at the last election many voters made their minds up at the last minute). But it is still striking that Wilders' Party for Freedom would jump from 15 seats in the September elections to around 24 now, according to this poll. The two governing parties, the liberal VVD and social democrat PvdA, would fall from 41 to 22 and from 38 to 23 seats respectively, after only a few months in power. The far left SP, which is also critical of the EU, has likewise profited from the fall in support for the government parties, increasing its number of seats to 22 from 15. The opposition D66, 50PLUS and the Christian Democrats would also see a large increase in votes. The September election squeezed out the centrist CDA and forced together the VVD and PvDA, which are not natural political bedfellows (besides their shared 'pragmatic' attitude to Europe). The coalition has therefore resulted in several unpopular decisions among each party's supporters. The VVD had to backtrack on the agreed introduction of an extra healthcare levy which would have hit the Dutch middle class hard. In return, it was also forced to sacrifice a number of tax cuts which the party thought it had secured. However, another important conclusion we can draw from the renewed success of both Wilders and the SP is that criticism of the eurozone bailouts and the EU in general is not going to go away. We noted this in our pre- and post-election analysis of the elections, with the parties of the centre increasingly taking their cues, if not their entire narratives, from the parties on their flanks. One example of this was Mark Rutte's election promise not to send any more money to Greece. A few weeks ago, at the occasion of the third Greek bailout - or extension of the second - Rutte was forced to admit that he thought it was a real pity "he couldn't entirely keep" his promise, describing it as a "necessary concession". Some were quick to proclaim the September election as a sign that the Dutch had "voted for Europe", but this was always a simplistic reading of the results and downplayed the potential for future volatility. These results would suggest that Dutch politics remain very unpredictable, and that Wilders and the Socialists are rubbing their hands in the wings. Excellent analysis of Dutc politics here and now. And the worst has yet to come next year(s)! Thank you for the good news that the Dutch political centre is collapsing. Yes. Good news indeed! 1. Rutte is a zombie-PM. Highly unlikley that he will regain credibility with large parts of his potential electorate. His party having the problem that there is no real successor and Rutte as the PM is very difficult to replace especially during the run. This process best case scenario for his party (replacing Rutte) probably goes by him stating that this is his last term well before the elections and bringing in the replacement leader. He messed it up completely by giving away mainly things that hit people directly in their wallets while getting other issues back without direct financial consequences for the voters. Plus it looks like he himself moved substantially to the left iso making it clear that the cabinet is left from him and his party. Breaking several important electionpromises and he simply doesnot look reliable/credible anymore. Plus it became more clear that he is a bit of a nitwit who simply cannot make rather simple calculations or do simple bookkeeping. 2. As a consequence thereof as well as that his coalition partner has moved considerably to the middle while they have made their gains in last election nearly all at their left the cabinet looks highly unstable. The parties could keep it alive unnaturally to avoid new elections but also drop it unnaturally to avoid more damage. Thing is we donot know and they donot know. 3. Stategic voting that brought this cabinet its majority looks highly doubtful in a next election. They basically broke their promises on too many issues and often one day after the elction. Difficult to see that many people will repeat stategic voting now. If you're not getting what you want in the first place you better vote for the real thing (SP and Wilders). 4. Wilders looks to have made a slight adjustment in strategy. Less only hard one-liners. Imho the right strategy for him people had enough of the previous Wilders. But unlike Rutte he adjusted the brand and not throw away a lot of the brandvalues like Rutte did and got caught with. 5. Their, the new cabinet's economic policies are horrible. The only proper thing is keeping the debt low. But basically it is more state and more transfers to the unproductive, hardly something that will work especially if the country's economy is already slightly under water. Very social indeed, but doing the job and get the economy going again is another issue. 6. SP seems to have their problem solved. But only partially they really need quickly a guy/woman that in case of a successful next election can be a PM (or Vice-PM). Their present leader simply will cost them a lot of votes if that becomes an issue. First of course if it goes that way, but also to make the party 'government-material'. People not like to vote only for a protest party. It would make the party more of a credible alternative for Dutch Labour. 7. Cabinet at present is likely somewhat more pro-Euro as the previous one. However the Dutch public is getting more and more enough of it. Which would mean a push in the other direction. So overall it will be very similar. 8. To watch is how stable it is. The coalitionagreement looks rubbish (full of unrealistic/ unworkable points) so that will give likely a good basis for quarrels. See how Wilders and Roemer do both in parliament as well in the polls. 9. The coalition made another mistake. By not assuring a majority in the Dutch senate. Simply stupid that if you have a lot of controversial issues that you assure a majority in both houses. Very unlikely that this will be corrected in next election (they are now at 30% in the polls and with little upward potential). This could be another possible source of instability simply getting things not through parliament. With nearly all opposition parties benefitting from an early election (as all main parties look to be in the plus because of this). 10. Interesting point a 50+ party has made it into parliament and does really well in the polls. probably something we will see more in Europe. Dutch are often faster than the rest of Europe with these kind of trends. The 2 government parties are collapsing, the Political centre much less. Rutte by becoming Marx Rutte has halved his party, but only 40% went to Wilders. The other 60% went from the VVD (right Centre) further left (CDA and D66). The 2 government parties both have clearly moved to the centre as well (may be necessary to form a government but it kills them in the polls). A lot of Rutte's voters came from the CDA (Christian Democrats) and now went back. Another group went to D66 left from the VVD as well (centre party) and likley go there for their social agenda (pro-gay marriage and that kind of stuff). The VVD had become a bit more conservative on social issues (probably to get voters from the Christian democrats). If on economic the parties become very similar a lot of voters like the the D66 social policies. Dutch Labour is clearly leaking at their left as well. Basically all startegic voters that go back to the Socialists SP. And if the SP gets its house in order will not go for a second round of strategic voting. Wilders is only right on European and immigration issues. Economic policies are rather left. Purely focussed on middle incomes that are a bit scared of what the future will bring. Seems like evvidence of good old ballot counting fraud to me. That's the way the EUSSR got a "yes" vote in Ireland on the Lisbon "Treaty." And we all know that, when it comes to creating the EUSSR, the ends ALWAYS justify the means, however deceitful, brutal, murderous and anti-democratic those means are. Maybe this analysis might convince Open Europe that its continued support for the EU and the Euro is not very popular everywhere. As far as this poll is concerned it is nothing more than a straw in the wind so far but the people are restive throughout Europe even in that highly self-disciplined Germany. The OECD, bearer of bad news at Christmas? Banking union: are you in or out? ECB's Chinese wall still full of holes? Banking union and the EBA: where do we stand?